Success is not an easy thing to reach in the business world. With a myriad of business boosting information out there, finding what could benefit you most is half the challenge. In this episode of Should I Start a Podcast, we have Tim Reid live from We Are Podcast 2015. In his keynote speech he delves into how he managed to create such a successful podcast using five simple methods. Tim Reid wanted to leave his past marketing career of 20 years at Clemengers and BrandHouse Arnold, and branch out on his own venture by guiding small businesses in their marketing endeavours. With his passion for sharing knowledge, Tim moved toward creating the podcast, Small Business, Big Marketing where he interviews successful small business owners from around the world. 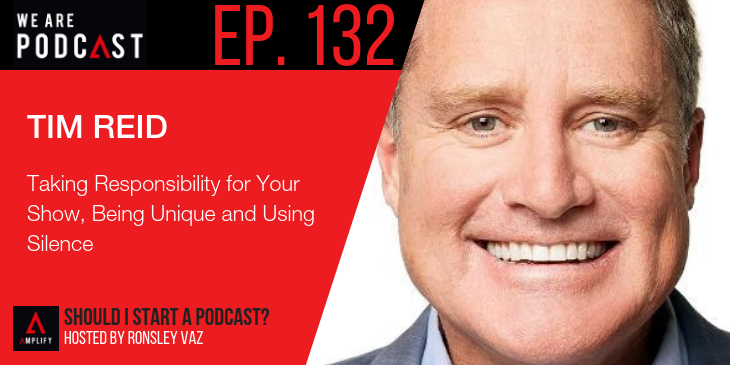 His podcast consistently ranks as the #1 marketing show on the Apple iTunes store, and his global listenership of tens of thousands of businesses owners look to him as the small business guru. Why you should take responsibility for creating the best show possible. Why simple audio equipment may be the way to go. Why perfection will mess you up every time. How getting to grips with what really motivates you will help you develop. Why utilizing your uniqueness makes life easier week by week. What jumping down the rabbit hole can do for your podcast. Why asking the hard questions leads to respect. How being silent is your secret weapon during interviews. How six months abstinence from your analytics can boost productivity. Why consistency plays a pivotal role in winning you a loyal following. How visualizing your podcast as a business can open up revenue channels. How to nail your editorial mission.